Our new clear HD-BLADE antennas are a big hit, but that leads to one common question: How do the antennas work if they’re clear? Actually, the better question to ask is probably how they work if they aren’t clear! Looking at a clear antenna, you can see the metal parts that make up the actual antenna. They are far too thin to stand up by themselves, which is why they are encased in a plastic rectangle. The plastic doesn’t do anything to help or hurt the antenna, whether it’s clear or black or some other color. It’s completely transparent to radio waves, regardless of the color that we see it. 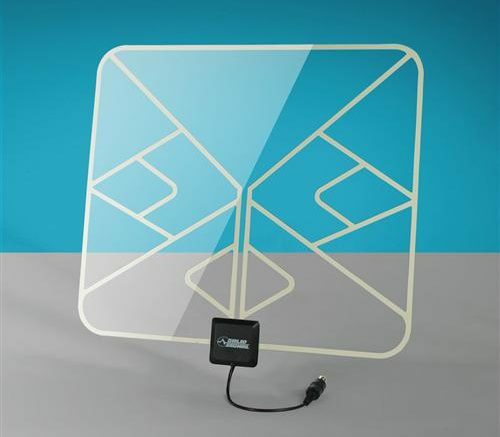 With a clear antenna, you can see the carefully-constructed pattern that makes up the actual antenna. It’s easy to see that the antenna is actually bigger than you think, but it’s folded at angles that let it take up less space. This makes for maximum efficiency in a small package. Of course, we still get people who would like it just fine if the antenna itself were clear instead of silver. That would be a little harder to accomplish. There aren’t any materials that are inexpensive enough to use in antennas that are transparent to our eyes but pick up radio signals. There probably are such materials, but it’s easy to imagine that they’re too expensive. That is, until they invent transparent aluminum. The end of broadcast TV?